Editable royalty-free map of Bahamas, The in vector-graphic online store. The Commonwealth of the Bahamas occupies an archipelago that lies across the Tropic of Cancer at the northwestern end of the West Indies, about 50 mi (80 km) off the southeast coast of Florida. Roughly 700 islands are included in the chain, as well as some 2,000 rock formations, islets, and cays (keys). Nassau, the capital, is located on New Providence, which occupies a central position in the archipelago and is the most densely populated island. Collectively, the rest of the inhabited Bahamas islands are known as the Family Islands. The islands, most of which are long, narrow, and fringed by coral reefs, originated as surface outcroppings of two submerged limestone banks, today known as the Great Bahama Bank and the Little Bahama Bank. The Bahamas lie on the North American Tectonic Plate, and the nation exercises maritime claims over the continental shelf to a depth of 656 ft (200 m). The terrain of the Bahamas is mostly flat and low, only a few feet above sea level in most places. There are no true mountains, and only a few hills. The tallest point is Mt. Alvernia on Cat Island (206 ft / 63 m). None of the Bahamas are large enough to support sig- nificant rivers or lakes, although there are many smallstreams and ponds. Coastal wetlands and mangrove swamps are common throughout the archipelago. Oceans and SeasThe Bahamas are spread over approximately 90,000 sq mi (233,000 sq km) of water in the southwestern por- tion of the North Atlantic Ocean. They are separated from Florida in the United States by the Straits of Florida. The Mayaguana Passage and the Caicos Passage, respectively north and south of the island of Mayaguana, allow clear sailing from east to west through the chain. A relatively large area of open water in the middle of the archipelago is known as Exuma Sound. 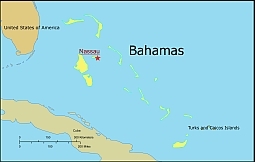 The most important island is New Providence, home to the capital city of Nassau; it has an area of 80 sq mi (207 sq km). Next in importance are Andros (at 1,600 sq mi / 4,144 sq km, the largest island), Great Abaco, and Eleuthera. Other major islands include Grand Bahama, Cat Island, San Salvador, Long Island, Great Exuma, Crooked Island, Acklins Island, Mayaguana, and Great Inagua. The Bahamas have a subtropical marine climate moderated by warm breezes from the Gulf Stream and the Atlantic Ocean. Average temperatures are 73°F (23°C) in winter (December–April) and 81°F (27°C) in summer (May–November). Rainfall averages 50 in (127 cm) annually, with some variation among the different islands. Occasional hurricanes occur between mid-July and mid-November. Hurricanes can cause major damage from winds and flooding, but their effects are limited since the islands are so widely scattered, with a reduced incidence of risk for any one island. Commercially significant minerals include salt, aragonite, and limestone. Other natural resources include fish from the surrounding water, and modest amounts of timber and arable land. However, the Bahamas’ economy relies more heavily on tourism than it does these resources.